Little Muff, our Ameracauna, taking a peek through the leaves of my spiderworts. Just a day after turning yellow, our caterpillar formed into her chrysalis. During this phase, the caterpillar liquefies inside the chrysalis, reorganizes and transforms into a butterfly. This is truly a magnificent process that scientists, to this day, do not fully understand. A little over two weeks after our caterpillar turned into a chrysalis, we noticed the chrysalis had changed into a very dark brown, almost black, color. 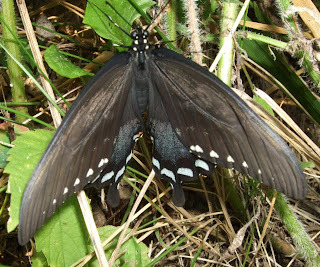 Then, a few hours later, as I was standing at the kitchen sink getting some water after a morning of weeding my garden, I happened to notice something huge and black in our butterfly container. 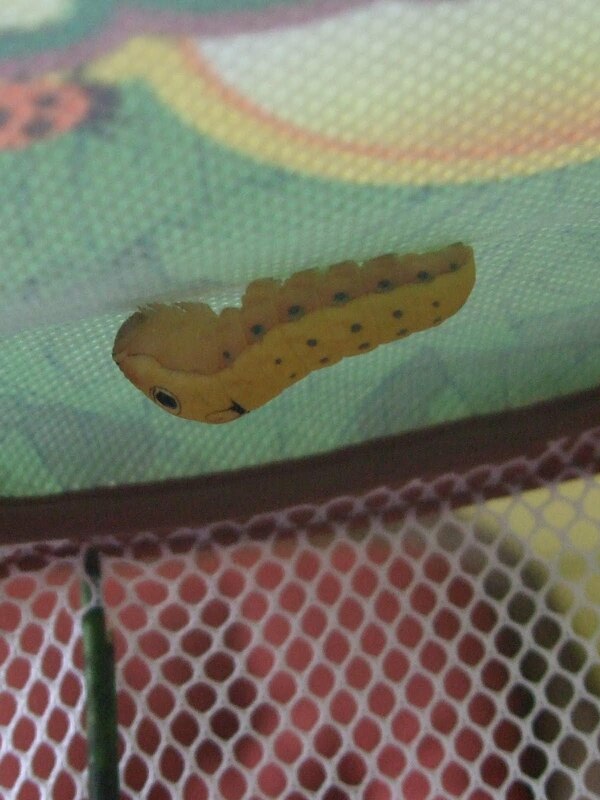 Our butterfly had hatched and she was beautiful! 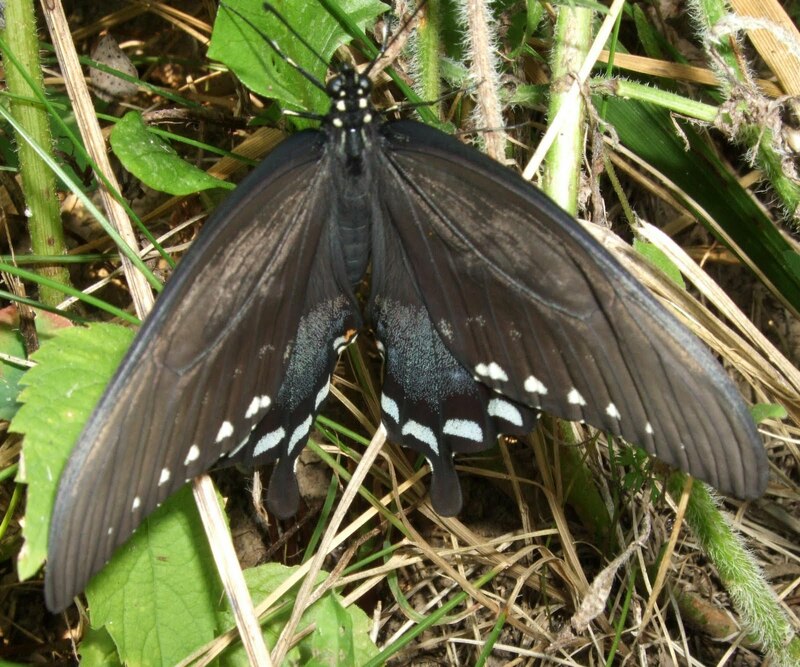 We knew she was a girl because of the iridescent blue on her wings; a boy would have been green. We kept her in our butterfly container until her wings were fully dry and working. 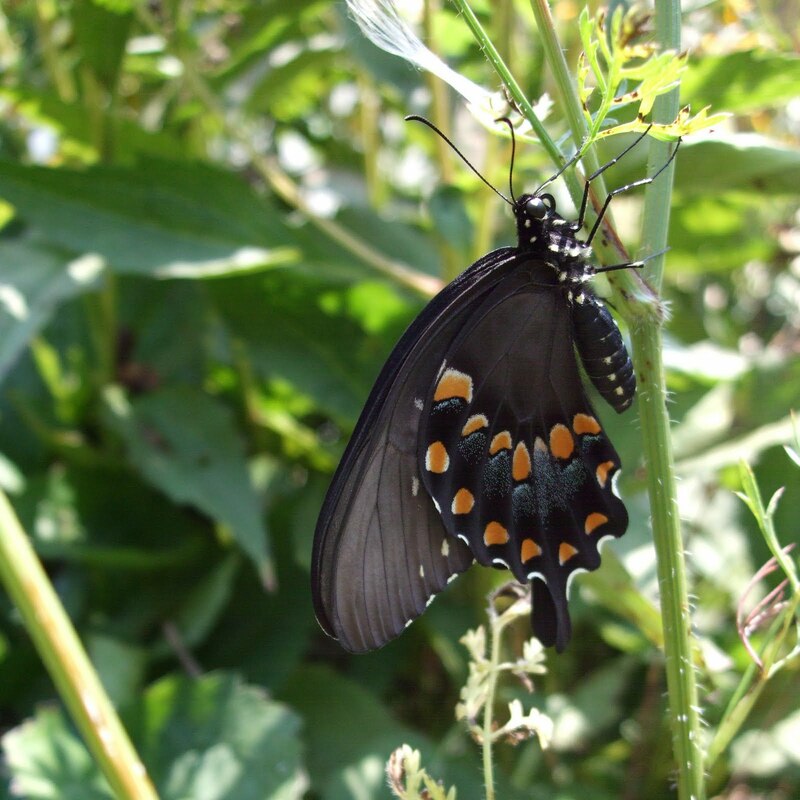 Then we released her into the butterfly garden with great hopes that she would find a mate and lay her own eggs to continue this incredible life cycle. Our dog, Sophie and our Buff Orpington enjoying the day together. We recently visited Mackinac Island, Michigan and found this beautiful sign during a stroll along the docks. While I can't vouch for the accomodations since we didn't stay there, I couldn't resist snapping a picture! 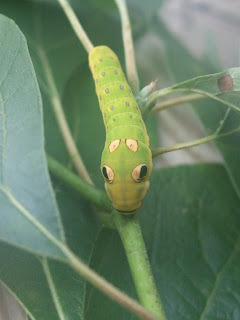 Fifteen days after first finding our spicebush swallowtail caterpillar, we noticed him beginning to enter another phase; he started to turn yellow. 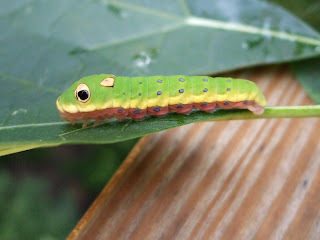 Just a few hours after taking the pictures above, our caterpillar was totally yellow, he had abandoned his sassafras branch and was hanging around the top of the butterfly container. 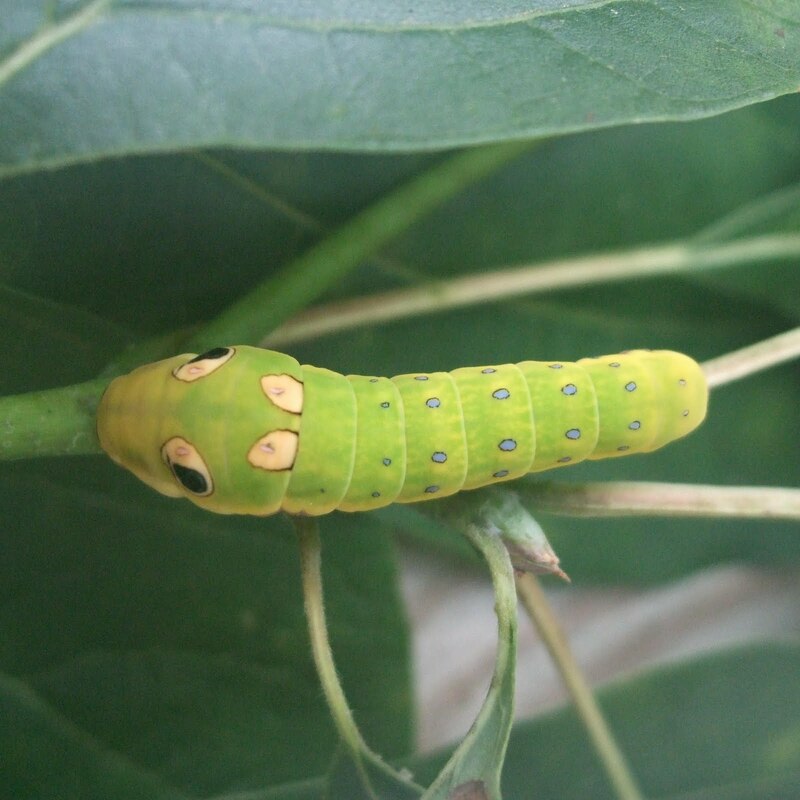 These are the caterpillar's final preparations before becoming a chrysalis! 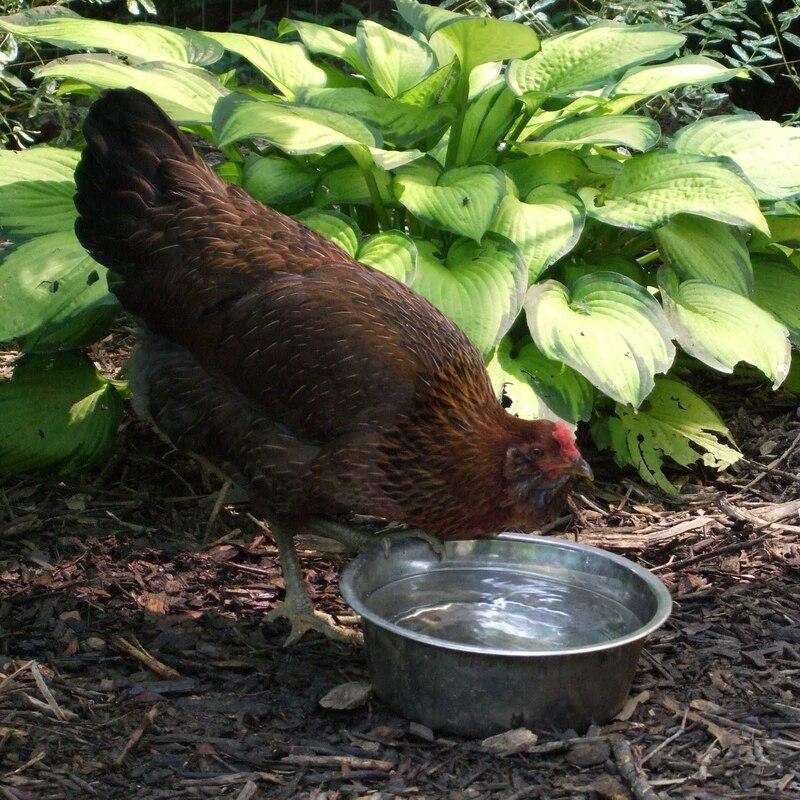 Little Muff, one of our new Ameracauna chickens, has always been a friendly chicken. But, she's easily scared and a little skittish. 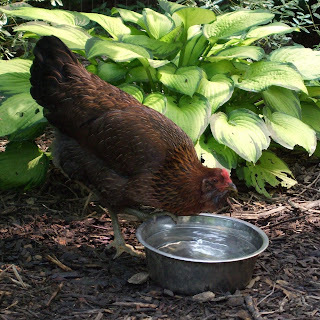 So, over the last few days, I have been highly entertained by her unexpected domineering behavior; not toward the other chickens, instead toward our outside cats. I first noticed this behavior while I was sitting on the patio petting our cat, Beth. Little Muff was across the yard grazing. She came running right over to Beth and stared her in the face. I didn't know what was going to come of this so I let the scenario play out. What happened actually shocked me; Little Muff pecked Beth right on the head. I think Beth was shocked too, since she got up and walked to my other side. Little Muff followed and pecked Beth again. This happened again and again until Beth finally left the area. Luckily I had my camera with me as I sat on the porch a few days later petting our other cat, Cleo. Muff, who's figured out how to squeeze through the deck railings, hopped up and marched right up to Cleo, looked her in the face and pecked her. Cleo automatically jumped onto the table to escape the wrath of Little Muff. Meanwhile Little Muff patrolled the area by marching around the table and keeping an eye on Cleo. After Little Muff considered the situation under control, she hopped off the deck and joined her flock. Little Muff mercilously drives Cleo from her relaxing place on the deck. Cleo takes refuge on the table while Little Muff keeps an eye on her. I guess this is one chicken with a lot of guts! My chickens have been lucky this summer. Their luck actually started this spring when my husband and I put in a great new shade garden right next to our deck. 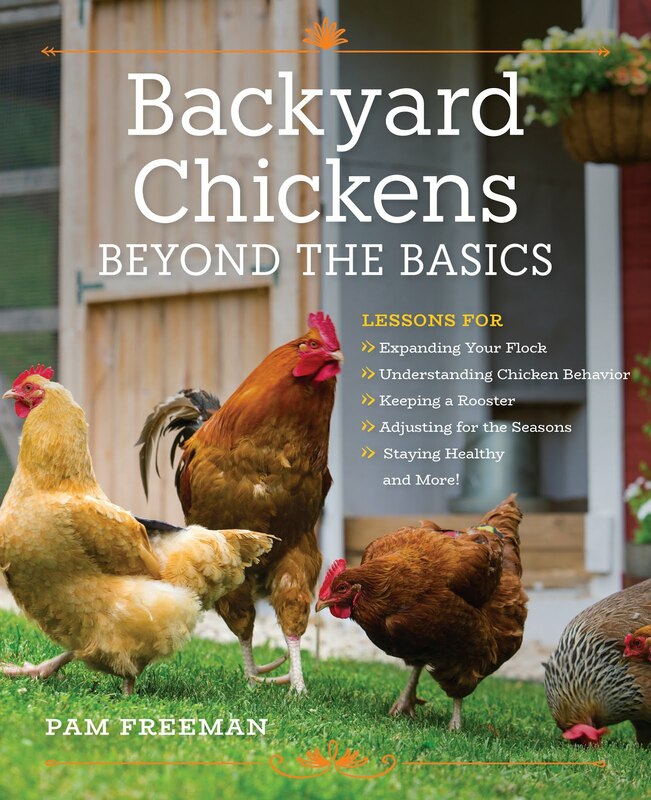 I don't really mind the chickens in that garden since there's not much damage they can do. 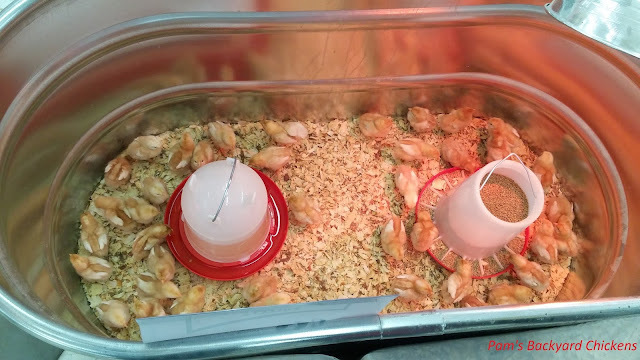 So, when the heat hit this summer, my chickens flocked to that area. 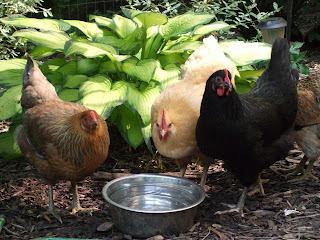 They spend their days cooling themselves in the shade and drinking from the dog bowl that I refill with cool water constantly. 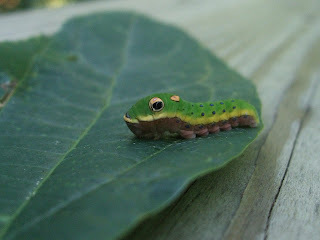 Our caterpillar is enjoying a new sassafras leaf. 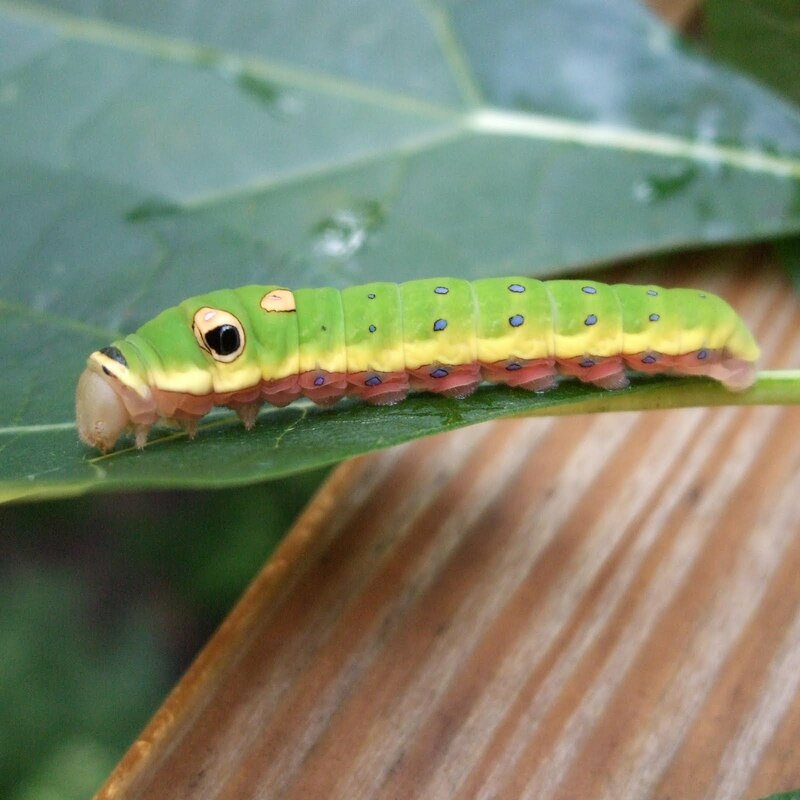 Each day after our caterpillar is given his new sassafras branch, he spins a mat of silk on his leaf of choice. This mat shrinks as it dries and curls the leaf's edges, giving him a place to hide. 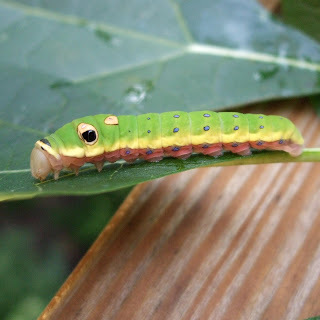 FYI - When you're near a host tree, you can look for folded leaves and you'll locate sleeping caterpillars inside. They come out at night to eat. 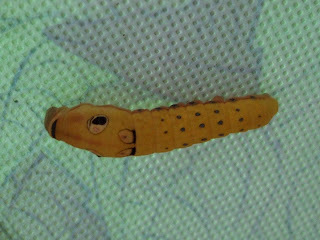 In the pictures below, our caterpillar is moving his head back and forth, spinning his mat. You can also see how much more plump he has gotten thirteen days after being found. Notice the pink beginning to show up around his legs on his bottom half. A curled leaf offers protection from daytime predators and heat. 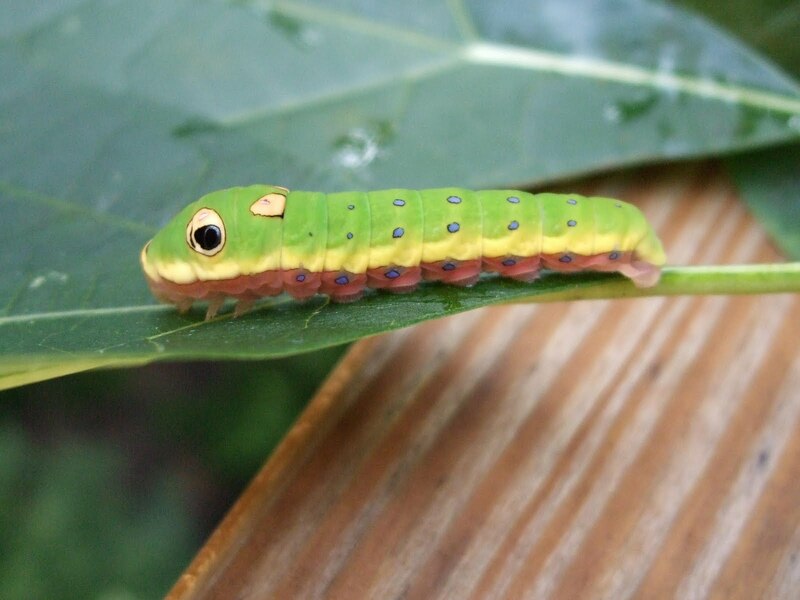 to eat the caterpillar inside. Be sure to check back next week, the changes will be dramatic! It came a little sooner than expected and we're thrilled. Our first egg from our new flock arrived on Friday. The best part is that it is a green egg from one of our Ameracaunas!